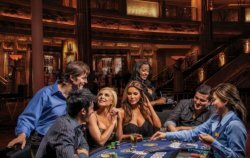 Card counting conditions are better at MGM than at most other places in Las Vegas. One great aspect of playing blackjack at MGM is that the casino is huge and is usually packed, especially on weekends. This gives surveillance and the pit crew a lot of action to watch over. There are plenty of high rollers in the S17 area, so it’s easy to blend in there. The double deck game at MGM Grand is really good for a solo card counter, but it’s watched pretty closely. Be sure to keep your sessions short and use some decent cover. For card counting teams, you’ll find that entering mid-shoe on the 6 deck tables is pretty easy and gets very little hassle. Some casinos don’t allow mid-shoe entry while others impose a mid-shoe entry max bet of $200 or so (New York, New York and Planet Hollywood come to mind). This isn’t the case at MGM, so go ahead and throw those yellow chips out there! Save your buddies some cash at the tables. Like BlackjackClassroom.com on Facebook!